The only antidote to all this venom is his friendship with fellow outcasts Travis and Lydia. But as they are starting their senior year, Dill feels the coils of his future tightening around him. Dill's only escapes are his music and his secret feelings for Lydia, neither of which he is brave enough to share. Graduation feels more like an ending to Dill than a beginning. But even before then, he must cope with another ending- one that will rock his life to the core. Dillard (Dill) Early, Jr. has it rough. His family is facing massive debt due to his mother's injuries and his father's imprisonment, and it has fallen upon his teenage shoulders to pay it off. Dill also has to live with the shadow of his father's wrongs hanging over him. Dillard Early, Sr. was a Pentecostal minister known as the Serpent King, who's extreme faith led him to use poisonous snakes in his sermons. Luckily, Dill has his best friends Travis and Lydia to help him cope with the pressure of high school ending and adult life beginning. My friends have been trying to get me to read The Serpent King since before it was released, and I'm glad I finally picked it up. I normally hate reading cute contemporaries, but there was nothing light and fluffy about this book. I ended up reading it extremely fast, and once I got to a certain point in the book, I couldn't put it down. (I can't say anything about it because of spoilers, but trust me, it will stop your heart for a moment.) The story was heartbreaking and beautiful and demonstrates Jeff Zentner's powerful storytelling abilities. I really loved our main characters of Dill, Travis, and Lydia. They were so completely different from each other and that made their friendship all the more beautiful. The main character of Dill was probably my least favorite. He was raised by the Serpent King, being forced to hold poisonous snakes as a testament to his faith. Lydia came from a wealthy family and reached internet stardom by creating her own blog. (Yay bloggers!) She was the only one of the three friends that appeared to have a bright future in front of her, although she wanted desperately for Dill and Travis to see their potential as well. Then there was Travis, my absolute favorite. He was obsessed with a fantasy book series and carried a staff everywhere he went. Travis had a harder life than anyone realized, and needed an escape into a world where he could be the hero. The only problem that I had with this book is pretty personal and not an issue with the book itself. I really can't stand reading about religion. If this doesn't bother you, then you will probably love this book. I personally really hate religion in my books, so there were many times where I was cringing or just trying to push through to get to the next part. This was really the only reason that I had to lower my rating. The book was wonderful as a whole, but there were times that I was really not enjoying what I was reading. 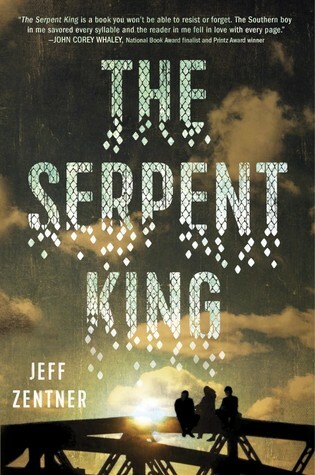 Despite the trouble I had reading The Serpent King, I do highly recommend it. It is beautifully written and we can all find someone to relate to within the story. Be prepared, however, because it will tear your heart to pieces when you least expect it. I might try the audiobook of Jeff's next novel, because I believe there is religion in that one as well. It will probably be hard for me to read, but I might give it a try.